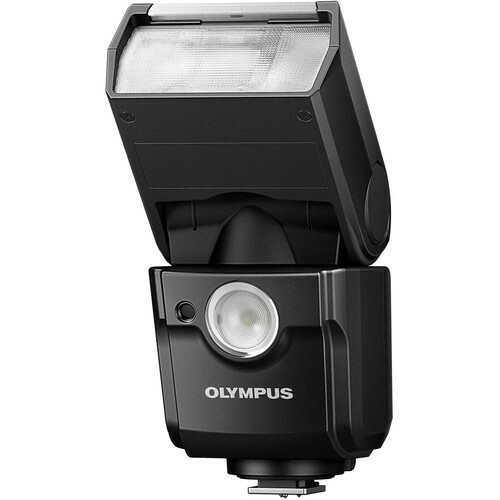 Sleek yet powerful, Olympus FL-700WR Electronic Flash is a wireless TTL-enabled strobe characterized by its weather-sealed design and 2.4 GHz radio control capabilities. The flash features a guide number of 137.8' at ISO 100, is fully compatible with the Olympus TTL system, and can function as a radio commander or receiver for wireless remote flash setups. Additionally, hybrid stills/video shooters can benefit from this flash as well thanks to a built-in LED video light for constant illumination. The flash head's design permits up to 90° upward tilt and 180° rotation in both directions for full bounce flash control. The flash's design offers seamless operation via rear dials and an LCD screen, and it conveniently accepts four AA batteries as its power source. Additionally, matching Olympus OM-D-series cameras, the body is splash, dust, and freeze-resistant for working in trying conditions. Can operate as either a 2.4 GHz radio commander or remote as part of Olympus's radio wireless system, including the FR-WR Receiver and FC-WR Commander. This system has an operating range of 98.4' and does not require line-of-sight. Flash mode switching is possible via wireless radio communication and automatic channel detection is possible when used as a commander. Guide number of 137.8' at ISO 100 and 75mm provides exceptional illumination in dark locations, and covers a focal length range of 12-75mm, or as wide as 7mm when using the built-in wide-angle panel. 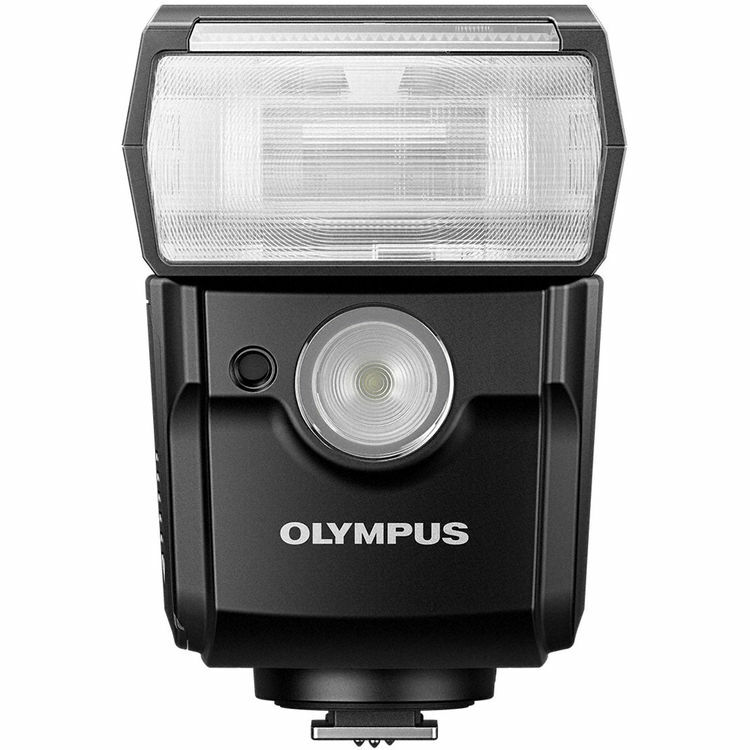 Flash head tilts upward to 90° and rotates left and right 180° for full bounce capabilities. LED video light provides constant illumination source as well as AF assist in dim lighting. It offers power adjustment from 1/1 to 1/32 and can output a max of 100 lux at 3.3'. IPX1-rated, dust- and splash-resistance along with an operating temperature range of 14-104°F provide this flash with the same level of sealing as Olympus's high-end mirrorless cameras, permitting use in a variety of inclement weather conditions. 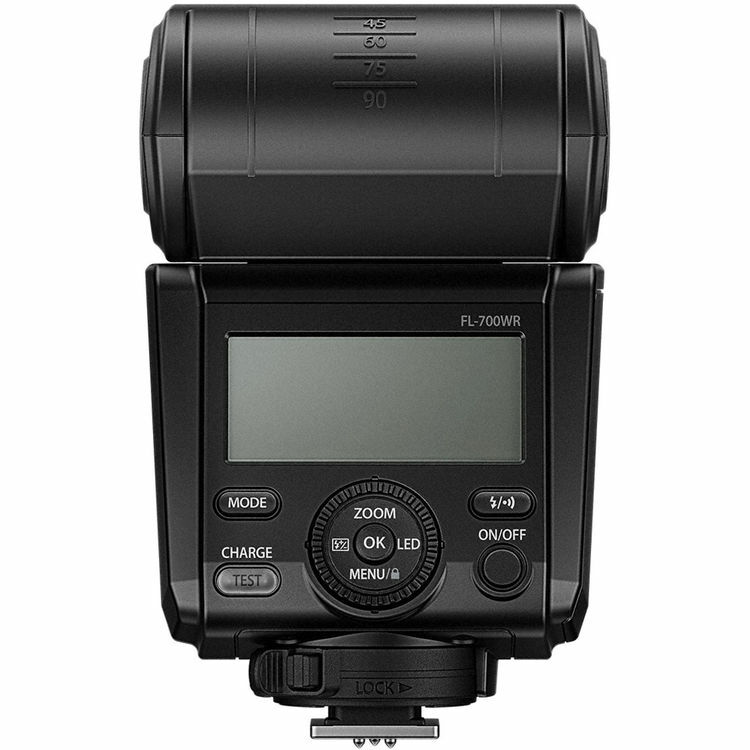 Flash supports rapid continuous shooting up to 10 fps at 1/16 power for approximately 50 consecutive frames when used with the OM-D E-M1X or E-M1 Mark II cameras. Super FP flash sync, first curtain, second curtain, and slow sync modes are available. Recycle time of just 1.5 seconds with NiMH batteries or 2.5 seconds with alkaline batteries.